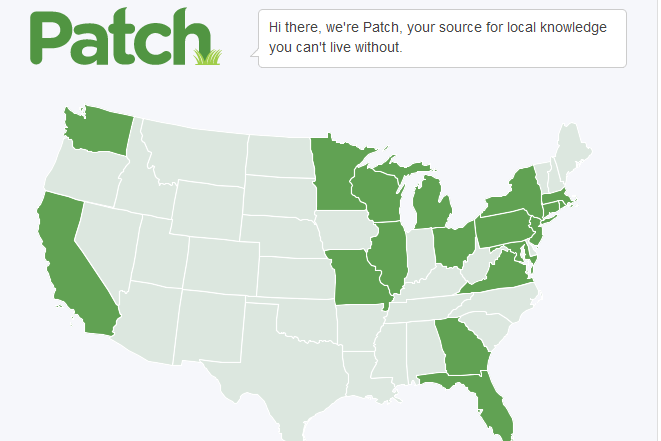 Can Patch Become the Huffington Post of Local News? Updated: AOL (s aol) continues to pour millions of dollars into its Patch.com “hyperlocal” news project, the company confirmed on Wednesday as it released its latest financial statements. But it’s also rolling out an expansion of that project aimed at doing to local news what The Huffington Post did to national and international news: namely, aggregating and “crowdsourcing” it. The new venture, called “Local Voices,” was launched on Thursday, and involves pulling in local bloggers and featuring their content on local Patch hubs. Can Arianna Huffington work the HuffPo magic a second time? And more importantly, will that help AOL dig itself out of the financial hole it’s in? As we’ve described before, AOL continues to scramble to try to generate new money-making services that can replace its Internet access business, which is declining rapidly, along with the company’s advertising revenue. In the most recent quarter, AOL said its overall revenue fell by 17 percent, and net income dropped by 86 percent. So CEO Tim Armstrong has been busy spending the cash the Internet access business still generates on things like the $315-million acquisition of Huffington Post, and on the expansion of its editorial and content operations — including Patch — which founder Arianna Huffington has taken over responsibility for. A venture like Patch doesn’t come cheap: AOL said that in the first quarter alone it spent $40 million on the project, which has seen the company hire journalists for close to 1,000 towns and communities across the U.S. — and that’s on top of the $75 million that it spent last year. [A]ggregation of any news affecting these communities; and cross-posting and amplifying the work of local bloggers who are already doing great work, providing them an even more powerful platform for expressing their views. It remains to be seen whether this kind of aggregation is welcomed by local bloggers, or whether they react like some of Huffington Post’s contributors did and later launch a class-action lawsuit looking to be paid. But the bigger question is whether AOL can even make this kind of aggregation work on a local scale. Plenty of similar hyperlocal web experiments have failed over the years, including Backfence and Bayosphere, as well as a more recent Washington-based venture called TBD, which was effectively scaled back dramatically by its parent company. The list of failures also includes some prominent ventures by mainstream media outlets such as The New York Times (Update: as associate managing editor Jim Schachter explains in a comment below, the Times venture still exists, but has been outsourced to local journalism students) and The Washington Post, both of which attempted to take a kind of Patch approach to local news. The most successful local news sites are those that have emerged from the communities they serve, including the startup Sacramento Press in California, and other long-time online communities such as Baristanet. As I’ve argued before, the automated aggregation approach taken by some ventures doesn’t seem to really work, in part because this leaves a local site without any real personality. Everyblock, which was acquired by MSNBC in 2009, recently redesigned the site because founder Adrian Holovaty said he realized automation alone wasn’t working. The bigger issue for AOL is that even if it manages to hit the Patch ball out of the park, and creates thriving communities in hundreds of locations across the U.S., it’s not clear whether that’s going to be a good business or not. Building online communities is all well and good, but generating revenue and profits is what AOL really needs to do. Both the New York Times and the Washington Post shut down their local ventures in part because they didn’t generate enough revenue to make them worthwhile. So far, Armstrong hasn’t made a strong case for why Patch should be any different. AOL says it expects to generate local advertising revenue from its Patch sites, but admits this isn’t even close to happening yet. Meanwhile, it plans to continue pouring millions into this unproven hyperlocal strategy. Tim Armstrong just keeps piling his chips higher and higher on his Patch bet, but the odds of winning continue to be extremely slim. AOL has been trying to go local for 15 years. They’ve failed every time. Karma I suspect. From “Digital City” to “Hometown AOL”, to the “Community Leader Lawsuit”, they take the same tired approach — con people into working for free. I’ve put together a spoof “Patch” at http://patch.framingham.com/ that chronicles all the lawsuits. The funniest (or saddest) thing is on May 10th, after giving the Patch editors marching order to recruit 5-10 unpaid bloggers, Arianna posts an article on HuffPost slamming the Obama administration for not creating jobs and not taking care of the middle class titled, ”If “America Can Do Whatever We Set Our Mind To,” How Come Our Leaders Won’t Set Their Minds on Jobs?” This she does on the heals of being sued by the last crowd she sourced into a $315M windfall. I hope people stand with the AFL-CIO, National Writers Association, and Newspaper unions in the boycott of all AOL Properties, (AOL, Patch, Huffington Post, Techcrunch, to name a few). I’m one of those bloggers who gives up my content for free on HuffPost (Denver edition), cross-posting content from my personal blog about the local Asian community. I was also Content Editor of AOL’s Digital City Denver back in the day, 1996-1998, and it’s been interesting to see the emphasis on “hyperlocal” cycling back (thanks to Rick Robinson for his walk through memory lane on StreetFightingMag.com). Many of my online gigs since Digital Cities have been aimed at hyperlocal audiences, whether it was for newspapers or the (pre-Rick Blair) Examiner.com. I’m fascinated with the focus on how Patch is taking on HuffPost characteristics, but I wonder if it makes better sense to convert all the Patch properties (with some re-structuring and massaging of style and content) into HuffPost local sites. I don’t know how Denver’s doing, but I suspect it has better brand recognition than most Patch sites in their communities. If they just bring a local sales force to leverage the existing audience and brand, how powerful would that be? 14 months ago, Main Street Connect, LLC launched its first community news site, thedailynorwalk.com, in Norwalk, CT; ten weeks later, its tenth site, thedailygreenwich.com. In 23 days (June 1), we launch 32 sites in Westchester, NY and announce the acquisition of some additional sites. This will bring us up to more than 50 sites, serving a population of more than 1.5 MM Americans, with a penetration of more than 25% of the population, 50% of households. Patch was operating in our first ten markets a year ahead of MSC. Their audience and revenues are a fraction MSCâ€™s in these markets, as any online investigation can confirm. If you dig deep, you will also find information about how much MSC has spent to get all this done â€“ a pittance, compared to the fortunes lavished by AOL. Our plan, as we built constructed a national community news company, was to make sure our model was popular, profitable, and viable before we propagated. Weâ€™ve done that. Our first sites will make money within the next several months; our new sites become cash-positive within 12 months of launch. I share these facts not to vaunt, but to suggest that Patchâ€™s massively unprofitable attempt to conquer community news is not predictive. High-quality, profitable community news â€“abundant, popular, profitable and responsive to the communities that are served â€“ is not a pipe-dream. Itâ€™s being done. No one, except AOL shareholders, should wring their hands at Patchâ€™s woes. Great profitable news is possible â€“ if you do it right. Our local Patch hasn’t amounted to a hill of beans – feel good articles that no-one reads. We started a homegrown local site that already reached “top-ramen” profitability in two months and it’s easy – you just have to be lean, mean, and plucky. Everything Patch isn’t. $40 million on Patch! Wow! That makes it really tough for us little guys (and gals) who are doing great things in local markets. Thank you so much, Mr. Ingram, for pointing out, “The most successful local news sites are those that have emerged from the communities they serve, including the startup Sacramento Press in California.” That’s what we’re hoping at TownSquareBuzz.com in Texas. You have to compare patch.com to zeole.com. Zeole.com has not taken a single penny but I think it has done much better than Patch. I am a blogger and I know how zeole.com touches bloggers in a way patch will never be able to because of its over funded culture. I’m the associate managing editor of The New York Times who launched and oversees – yes, present tense – our hyper local effort, The Local. You mistakenly say here that we “shut down” our local venture. We publish two Locals – one in Fort Greene and Clinton Hill, Brooklyn (NYTimes.com/fortgreene), and one in the East Village neighborhood of Manhattan (NYTimes.com/east village). They are collaborations with, respectively, the journalism schools at CUNY and NYU, and they are thriving elements of those schools’ journalism programs. They also are thriving contributors to their communities’ lives. For each site, a high proportion of the content – posts, videos, photos, hard news, features – is contributed by neighborhood residents. So props to our friends at Patch (which has hired Local contributors into full-time jobs) for recognizing the power of community engagement. And props to them for investing so heavily in local journalism. The question remains, as you say, whether the Patch business model is viable. The Local’s model – newsroom/jschool collaboration to inject professional journalism into the civic arena – doesn’t have millions from AOL shareholders behind it. But there’s a lot of passion, smarts and elbow grease being invested. In the present tense. Thanks, Jim — I will definitely clarify that in the post. Appreciate the heads up. Well put, Jim. While there are certainly some hyperlocal blogs (including some of the ones I administer in NJ) that view Patch with suspicion, I salute what they’re doing, and applaud every experiment they employ. From the local Ask/Answer feature to the use of Outside.In to aggregate content from other hyperlocals, they’re trying new stuff every day, and making as much progress as anyone at reaching a breakthrough. It’s right to question the viability of the hyperlocal business model, but just because the Guardian or the NY Times no longer operates their hyperlocals out of the newsroom shouldn’t mean that the sites have “failed.” We’re all just trying to find the right formula and partnershipsâ€”be they with universities, other blogs, citizen jouranlists, startups like SeeClickFixâ€”to continue bringing this kind of journalism to smaller communities. And as you say, investing a lot of “elbow grease” to make that happen.